Description Sunroof, 3rd Row Seat, Heated Leather Seats, Power Liftgate, Rear Air, Alloy Wheels. FUEL EFFICIENT 27 MPG Hwy/19 MPG City! Crystal Black Pearl exterior and Black interior, EX-L trim. Warranty 5 yrs/60k Miles - Drivetrain Warranty; AND MORE! KEY FEATURES INCLUDE Leather Seats, Third Row Seat, Sunroof, Power Liftgate, Rear Air. Rear Spoiler, MP3 Player, Remote Trunk Release, Privacy Glass, Keyless Entry. 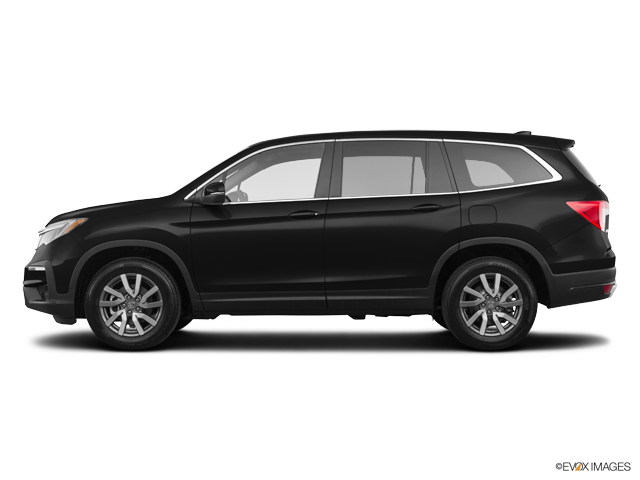 Honda EX-L with Crystal Black Pearl exterior and Black interior features a V6 Cylinder Engine with 280 HP at 6000 RPM*. EXPERTS CONCLUDE "With ample power, a transmission offering full manual control and respectable handling, the Pilot is an athlete in the three-row SUV segment. It's a champ on mountain roads, and it can manage slippery surfaces should you opt for all-wheel drive." -Edmunds.com. Great Gas Mileage: 27 MPG Hwy. Horsepower calculations based on trim engine configuration. Fuel economy calculations based on original manufacturer data for trim engine configuration. Please confirm the accuracy of the included equipment by calling us prior to purchase.